Rents rose nationwide by an average of 9.8% in the 12 months to December 2018. 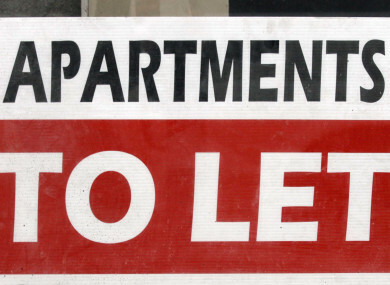 RENTS ROSE NATIONWIDE by an average of 9.8% in the 12 months to December 2018, according to the latest quarterly Rental Report by Daft.ie. Rents continue to rise more rapidly in Ireland’s other cities. In Limerick and Waterford cities, rents were 16% and 16.7% higher than a year previously, respectively. Galway saw its rents increase by 13.1% over the course of the year, while in Cork city, rents rose by 11.4%. Outside the five main cities, rents rose by an average of 10.4%. The slight easing in inflation comes as availability shows modest signs of improvement, the report notes. There were 3,641 properties available to rent nationwide on 1 January. This marks an 11% improvement on the same date in 2018 and is only the second time – together with February 2017 – that stock on the market improved at a double-digit rate. The improvement in availability is led by Dublin (up 18% year-on-year on 1 January) but was seen in all parts of the country. There are over 1,000 property searches taking place every minute on Daft.ie. Ronan Lyons, author of the report and economist at Trinity College Dublin, said: “A rare improvement in availability of rental accommodation at year-end has meant a slight easing in rental inflation. “This underscores the importance of additional supply in solving the problems of the rental sector, which have been ongoing for nearly eight years. Responding to the report, the Simon Communities of Ireland said tenants nationwide are faced with a “huge disadvantage” in terms of housing. Paul Sheehan of the Simon Communities said measures are needed urgently to enhance security of tenure in the private rental market. “As this reports shows, despite the supply of private rented properties improving, rent prices continue to increase, meaning that the almost half-million renters across Ireland face a huge disadvantage in terms of their housing. Nearly 10,000 men, women and children remain stuck in emergency accommodation. Many have come from the private rental sector, where they were forced to give up the homes that they already had due to spiralling rents. Now their only option is to remain stuck in emergency accommodation as housing is expensive beyond reach and supply, while increasing, remains far too low. Sheehan said Rent Pressure Zones provided for in existing legislation “need to be properly monitored and continuously enforced by the Residential Tenancies Board”. “Loopholes such as the Section 34 (of the Residential Tenancies Act 2004) clause allowing for evictions due to reasons of sale or renovation, are being misused. More broadly, it is clear that the private sector is struggling to deliver the level of affordable housing needed in this country in the long-term,” he stated. Email “The average monthly rent in Ireland is over €1,300 - €300 higher than the 2008 peak ”. Feedback on “The average monthly rent in Ireland is over €1,300 - €300 higher than the 2008 peak ”.